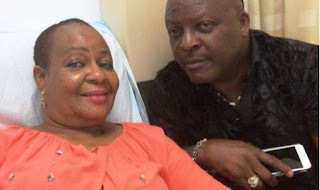 New reports claim afro juju maestro Sir Shina Peters, father of music director Clarence Peters, has left his wife Sammie Peters. The veteran musician is said to have taken a new wife, Olajumoke Olayinka Peters. According to Capital NG, Sammie who recently returned to Nigeria following a battle with cancer is heartbroken. Sammie is particularly heartbroken that Shina would desert her just when she started recuperating from a devastating bout of terminal cancer. When Sammie was diagnosed with the life-threatening disease, not a few people thought Shina’s world would crumble and crash upon him. This is because his pain and fear was visible for all to see. Eventually, Sammie beat the disease but soon after she returned to Nigeria following her successful treatment of the disease abroad, Shina deserted her. The Afrojuju maestro has abandoned the woman to whom he professed undying love for his new heartthrob, Olajumoke, who he attends social functions with. We saw them at Demola Oniru’s birthday some days ago. Sammie on the other hand, is not happy about her husband betrayal as it is barely six months since she got back from America where she received her treatment. She has however, been left to lament her fate in silence. “Sources told us that the musician has been moving from one party to another party, painting the town red with his new wife. On January 7, Sammie returned to the country four days before her 56th birthday after undergoing almost two years of cancer treatment in the United States. The couple are yet to confirm or deny the story.